Lantern slide photograph on glass in wood mount, William Langenheim (1807–1874) and Frederick Langenheim (1809–1879) Philadelphia, 1850, Smithsonian Castle Collection, gift of Tom Rall, Arlington, Virginia. Tom Rall, from Arlington, Virginia, is an avid collector of vintage photos, daguerreotypes and glass lantern slides. When he mentioned to his old friend Paula Richardson Fleming, a retired Smithsonian photo archivist, that he had among his collection a glass slide that might depict the Smithsonian Institution Building, she at first didn’t think much about it. After all, the Smithsonian “Castle” is an iconic building that has always been a favorite subject for photographers. It wasn’t until she got a close look at the undated glass plate at the annual D.C. Antique Photo and Postcard Show this past spring that she realized Rall might have something very special - a photo of the Smithsonian Castle taken while it was still under construction. They took the plate to Richard Stamm, curator of the Smithsonian Castle Collection. “I was able to pin-point the year the photo was taken based on the progress of the building’s construction as reported yearly by the Building Committee in our early SI Annual Reports,” said Stamm. 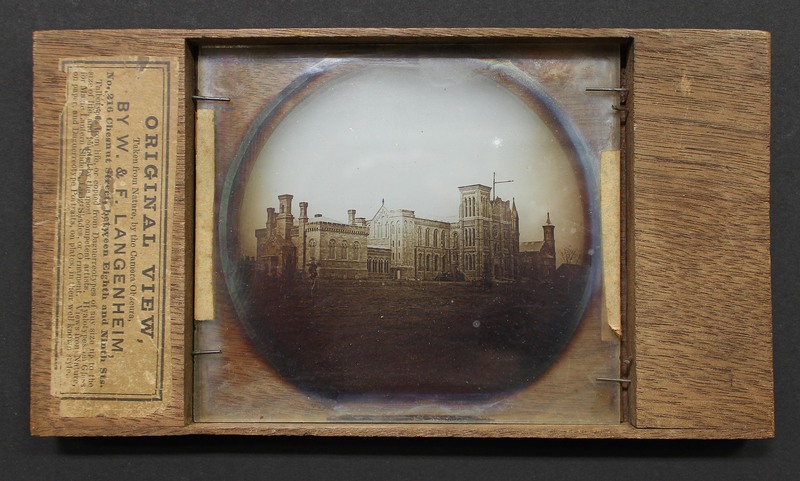 He and Fleming conducted more research at the Library of Congress and through other sources and were able to confirm the picture was taken in June or July of 1850 - the earliest known photograph of the Smithsonian Castle. After President James K. Polk signed the legislation creating the Smithsonian on August 10, 1846, one of the first tasks facing its governing body, the Board of Regents, was to erect a building to house the new Institution. Architect James Renwick designed the Smithsonian Institution Building in an imposing Norman style meant to identify it immediately as an important educational institution. The day construction began was declared a holiday and on May 1, 1847, a mile-long parade made its way from City Hall to the White House, where President Polk joined the procession as it continued to the Smithsonian grounds. Once there, more than 6,000 people watched as the cornerstone was laid. The photograph in Rall’s collection, taken three years later, shows the building’s two completed wings - the east wing housed the lecture hall, laboratories and apartments for the Secretary of the Smithsonian; the west wing contained the library and reading room. The central portion of the building, now called the Great Hall, was still empty and would remain so until 1855 when it began to be used as exhibition and collection space. At the time of this photograph, only two of the Castle’s nine towers were completed. The crane in the image rises over the North Tower, which would eventually rise 140 feet above the National Mall. The carriage porch at the front of the building would not be completed until late 1851. The photograph also shows a small workman’s shed in front of the Castle, which was likely used by the stonemasons. The small trees and bushes in front of the Castle were planted by the Smithsonian and anticipated Andrew Jackson Downing’s landscaping plan. William and Frank Langenheim of Philadelphia took the photograph using a new process they developed in 1849 and called hyalotype (from the Greek hyalos, meaning glass and typos meaning image or impression). This process produced a highly detailed and accurate glass negative that could then be used to print either paper photographs or glass lantern slides. Since the exposure time for hyalotypes was about one minute, the process was well suited for architectural studies, but impractical for portraiture. The image of the Castle was part of a set of 126 views of Washington, D.C. published by the Langenheim brothers in 1850, several of which were later exhibited at the 1851 Crystal Palace Exposition in London. Tom Rall has made this rare hyalotype a gift to the Smithsonian Castle Collection. It will go on display in the Castle’s Great Hall today, August 10, on the 169th anniversary of the Smithsonian’s founding.